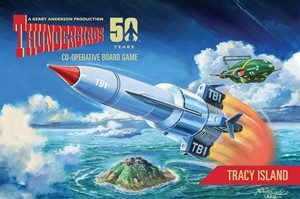 Adds more cards, updates the disaster cards, adds new pod vehicles, replaces the pod vehicle tokens for 14 models, adds Tracy Island, FAB 2, Ladybird Jet, Tin-Tin, Brains and Parker. As you can see this adds a lot to the game and as each character is in play at all times gives you more options for who you play, as well as who you pick up and take with you to try to stop disasters or uncover the next part of the Hoods Evil plans. Tracy Island adds somewhere where characters can be placed, which makes game play smoother. All in all a great expansion. If you are one of those people who doesn’t like playing well with others (we all know someone like that) this expansion adds the ability for someone to play as the Hood. This adds a little complexity as the Hood is trying to find out about you vehicles with his cool camera (actually a cool cardboard camera in the expansion with 4 pictures he hopes to get) while also trying to make your life that more harder. 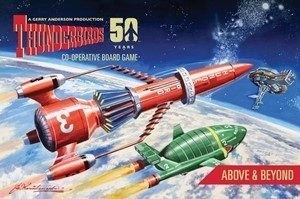 Also added is the Hood, and his vehicles of a plane and submarine, eight Hood agent models, the Hoods Lair model and Creighton-ward Manor model (Lady Penelope’s house) and extra cards. This is a good expansion for those who want even more from this awesome game. This expansion adds disaster vehicle cards and vehicle models. If you complete a task that uses this model, then you gain it as a bonus for future use. It also has replacement character cards for if you want to develop your character as you play your game, levelling them up to gain bonus abilities. Other thing this expansion adds is level five scheme cards to up your difficulty level. 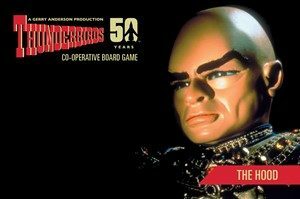 There is also a sand timer and Jeff Tracy model as well. This expansion is for those who want to add more to their game, whether it is a time element, a higher difficulty level, the chance to level up your character or add disaster vehicles to your game. The great thing about this expansion is that you can chose which parts you want to add or not as the case may be.